Sound and vibration have long been used for creation, communication, creativity and the healing of Mind, Body and Spirit. Sound works with the natural vibrations and frequencies of the body all the way down to cellular & neurological levels helping to restore a natural balance. Within this balance can come deep relaxation allowing healing to happen on both physical and spiritual plains. Opening up the possibilities for inner exploration, communication with our deeper selves. Where we can receive messages that we can apply to our every day lives that can bring us closer to our Higher Self, more Joy and our Greater Sense of Purpose. Participants often leave feeling relaxed, inspired and a feeling of inner peace. ﻿What will you experience in this amazing offering? 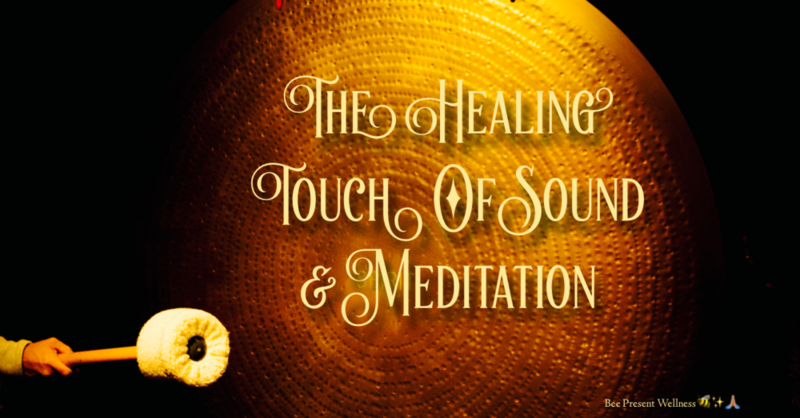 In this session we will be connecting with breath and body to help enter into a relaxed state of being where you will embrace the healing touch from bells, chimes, singing bowls, gongs, essential oils and Reiki. Come join another collaboration from Bee Present Wellness, Melinda Dunmire Holistic Health & Spiritual Advisor and Cosmic Vibrations, where we once again offer a warm, safe, nurturing environment where participants can feel free to let down their walls, take off their masks, open the heart space, be courageous in their vulnerability, bee themselves and create community. Feel free to make a cozy nest and be comfortable with our many bolsters and blankets as Melinda and Sean use their harmonious energies and the healing vibrations of plant medicine, instruments and reiki to guide you on a personal journey or relaxation and Self exploration. Please bring: Your beautiful most authentic self, a sealed container of water & a journal, if you wish to write down any guidance or messages that you may receive. Investment: $22 Early Bird till 4/2. After $33. For drop in please bring cash or check. Sean Gross is the founder of Cosmic Vibrations and an advocate of community, connection, compassion and curiosity. With roots tied into Shamanism, Tantra and Buddhism, studies in Shamanic Energy Work, Reiki, Massage & Sound Healing and involvement in The New Culture community, Sean is sure to have something to offer to everyone. Melinda Dunmire is the most genuine, compassionate, and understanding person you will ever meet. She has always been an empath and used intuition to guide and connect with others. Her career choices have always been gravitated towards working and assisting other individuals with their health, wellness, and healing. Today Melinda has teamed up with Sean Gross to facilitate community moon circles, sound meditation circles, and holistic nutrition advising. She will also be offering psychic medium readings paired with reiki healing on an individual basis at BeePresent Wellness. This summer she is hosting and organizing her second women's retreat at Amethyst Retreat Center.